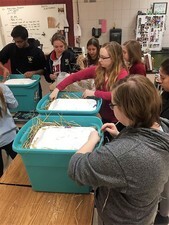 It is the first year for the Maple Grove Senior High CAWS (Crimson Animal Welfare and Sciences) Club - the idea stemming from a student after hearing a speaker in Todd Martins’s AP biology class last fall. The mission the CAWS Club's is to expose students to animal welfare issues, animal related careers, promote volunteerism, get students involved hands on helping animals, let students explore animal related sciences, and to instill a respect for animals and their environments in students. “Jen’s passion for helping animals was evident. She is an inspired and industrious young woman who I have the pleasure of working with over the past two years. I willingly accepted her offer to start a group,” Martin said. The meetings are open to any interested students, but currently 15 regular members attend. The dedication of the members has been one of the highlights for Jennifer. “These students clearly demonstrate how much they care about animals, and it gives me a lot of hope for the future,” she said. Recently, the group created protective shelters for feral cats to donate to the Animal Humane Society. Materials were purchased for the project from a fundraiser and created constructed with a styrofoam interior and packed with straw for warmth. Martin said he has been “impressed” with the group’s willingness to setup a fundraiser with a local business as well as the “creative ways” the group spends meetings. “Building cat-shelters was something that most people would never think of as a project, but these guys just took it on with a happy fervor,” he said. The protective shelter project was just the beginning for the club. “We've got quite a bit in store for the remainder of the school year,” Jennifer said, indicating the group will be learning about native wildlife and their preservation and participating in another volunteer project. Another topic of discussion includes the role of legislature in animal welfare issues. “We are also setting up a team to participate in the Animal Humane Society's 2017 Walk for Animals,” she said.